In 1965, as the space race between the United States and the Soviet Union was hotting up, officials at NASA realised that they did not have “space rated” wristwatch that could be used for the upcoming Project Gemini. Given that the program was slated to include an EVA or space walk, there was an obvious need for a watch that could withstand exposure to vacuum and other rigours of spaceflight. In addition to being able to keep good time under such conditions, the watch would have to incorporate a chronograph or stop-watch function, so astronauts could see at a glance how long they had spent outside their spacecraft and to help carry out other tasks that required accurate timing. Rather than go through the time consuming procedure of inviting bids for a “space watch”, NASA decided to send a couple of engineers to out to downtown Houston with instructions to procure a variety of off-the-shelf chronographs for testing. The tests included exposure to extreme temperatures, vacuum, intense humidity, shock, acceleration, pressure and vibration. At the end of the tests, NASA had a clear winner as the watch most suitable for spaceflight: the Omega Speedmaster. The Speedmaster was first introduced by in 1957 and utilised the Lemania 2310 (AKA Omega 321) manual-wind movement. It is often stated that NASA specified a manual-wind movement because they thought automatic (“self-winding”) movements would not function in zero-gravity conditions, but this is incorrect on two counts. Firstly an automatic works by inertia and is not dependent on gravity; secondly the simple reason NASA selected a manual-wind chronograph is that at the time that was the only type available. The first automatic chronograph movement – the Zenith el Primero – did not come into use until near the end of the decade. However it is likely that in the cramped conditions of a Gemini or Apollo spacecraft, there would be insufficient activity to keep an automatic fully wound and a manual-wind would be more suitable. On 3 June 1965, Gemini 4 pilot Edward White became the first US astronaut to make a spacewalk. 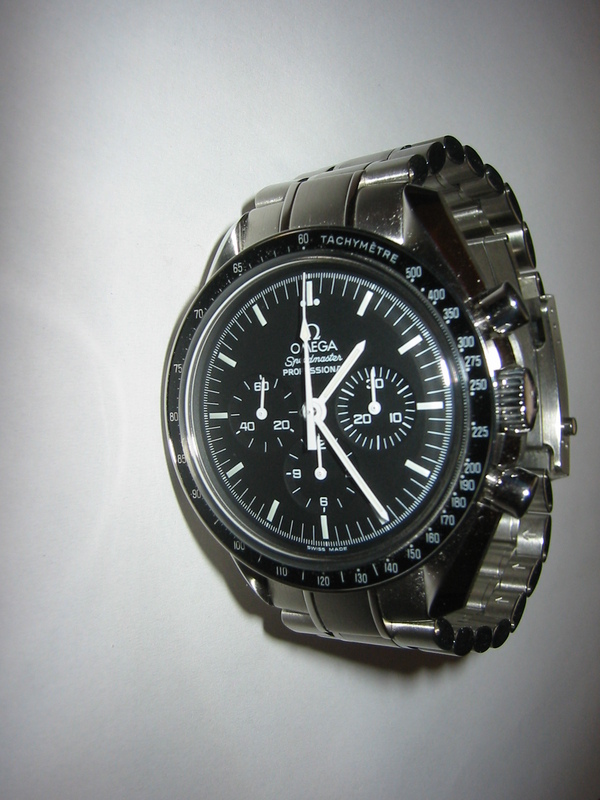 He was wearing an Omega Speedmaster, strapped to the outside of his spacesuit with a Velcro strap. Curiously it was not until almost a year later that Omega finally learned the use to which NASA had been putting their watches. As might be expected, they wasted little time in cashing in and photographs of White’s spacewalk were soon featuring in their advertising literature. The watch itself was renamed the Speedmaster Professional, but its finest hour was yet to come. Early on the morning of 21 July 1969, Buzz Aldrin stepped out onto the surface of the Moon wearing a Speedmaster Professional, which thus became the first watch to be worn on the Moon. Earlier, Neil Armstrong had had to leave his own watch in the Eagle lunar module after the lander’s onboard chronometer developed a malfunction. Sadly this historic watch was later stolen while on loan to the Smithsonian and has never been recovered. In April the following year a Speedmaster Professional was used to time a crucial engine burn aboard the crippled Apollo XIII during the desperate and ultimately successful endeavour to return the spacecraft safely to Earth. Meanwhile feeling was growing that an American watch should be used on NASA moon missions and the US-owned Bulova company lobbied the White House for their watches to be used instead of the “Speedy Pro”. Eventually NASA was persuaded to test a fresh batch of watches, including a specially-manufactured Bulova chronograph, but the Omega again came out on top with the Bulova stopping several times during testing. 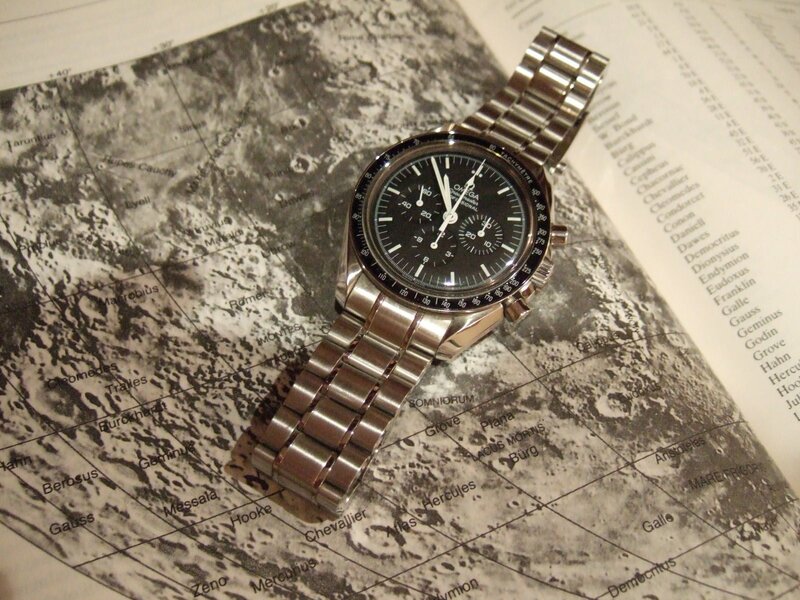 By now, not only NASA was equipping its astronauts with the Speedmaster Professional. In 1975, when an Apollo spacecraft rendezvoused with a Soviet Soyuz in Earth orbit, both crews were wearing what had by now become known as the Moonwatch. In 1978 NASA held a fresh series of tests ahead of the Space Shuttle program. Once again the Speedmaster Professional triumphed. The watch had by now received an updated movement, the Lemania 1873 (AKA Omega 861), which featured a shuttle/cam system rather than a column-wheel. The former design is simpler and thus is cheaper to both manufacture and service, but it yields nothing in terms of performance and reliability. The 1873 is again a manual-wind movement. Externally however the Speedmaster Professional has changed very little in over half a century, even retaining its old-fashioned Hessalite (plexiglass) crystal in preference to a modern scratch-resistant sapphire crystal. This has been at the request of NASA. Plexiglass scratches quite easily, but it is virtually indestructible. By contrast, a sharp blow can shatter a sapphire crystal. Having sapphire fragments floating about inside the zero-g environment of a spacecraft is obviously not a good idea! A sapphire version, also featuring a sapphire display back, is available at extra cost but many enthusiasts prefer the Hessalite model, which is the only flight-qualified version. 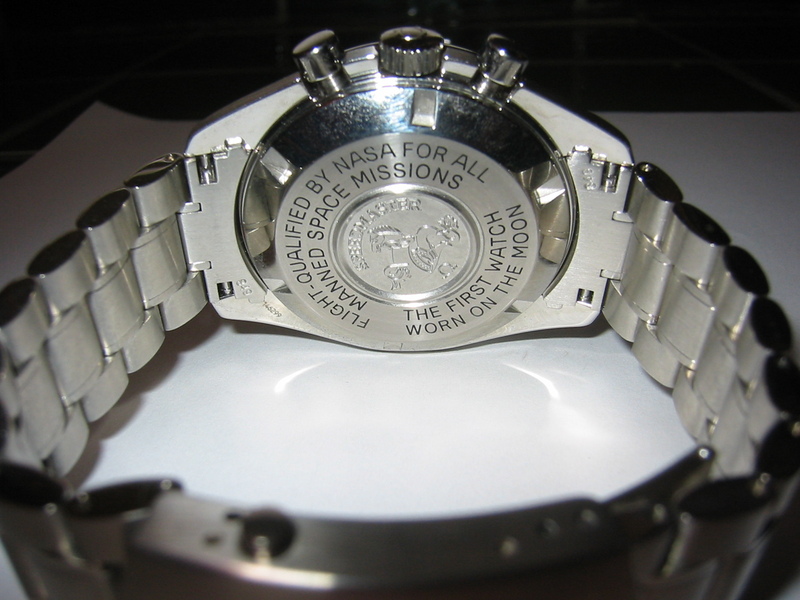 The Speedy Pro is certainly not the only watch to go into space (and was probably not even the only watch worn on the Moon – contra Omega’s website), but even now it is the only watch permitted to be used for EVAs from the International Space Station or from the Space Shuttle. The Casio G-Shock – a watch almost as iconic as the Speedy – is routinely worn aboard the ISS, but because their batteries may explode in a vacuum, they cannot be used for spacewalking. Who knows, the Omega Speedmaster Professional may even eventually become known as the Marswatch.